Sarah Michelle Gellar’s softer side appears as she picks up the batterie de cuisine and tackles saving a restaurant from certain death. When it looks like Amanda’s career is about to end as a chef, an angel appears in her life and gives her some sage advice about looking for a door that will open when another one closes. As the chef of a failing 70 year-old restaurant, the Southern Cross, she only has her loyal clientele who are not there for the food. To say she is adorable as a chef is an understatement. She appears in a variety of fashionable outfits and weaves a sweet innocent spell on the viewer. Worth watching to see Sarah dressed up in a variety of outfits and different hairstyles. There are also scenes of outdoor markets, beautiful orchids and of course restaurant scenes, Sarah shopping, cooking and crawling about on the floor chasing after magical crabs all to romantic music. Instead of slaying vampires, “Buffy” bewitches Tom Bartlett (Sean Patrick Flanery) and entices love right into her life through cooking a variety of gourmet dishes. If every man has his weakness, Tom’s weakness is luscious cuisine. As every kitchen sorceress has discovered, the right food can create the right mood and can invite happiness and love into your life. I loved the dance scene and the scene where Tom and Amanda disappear into the scented mist. This movie emphasizes the aphrodisiac qualities of food. Amanda Shelton (Sarah) only discovers her true cooking talents after meeting Tom. At first she seems unaware of her current fate while Tom seems to be trying to control his fate. He is disturbed by his lack of emotional control and when he falls “in love” with Amanda, his world seems to be spinning out of control. Is it love that makes Amanda a better cook and makes her cooking taste even better to Tom? Are their senses in a state of heightened awareness from the chemicals rushing through their bodies or is there magic floating about? Once she finds a recipe for caramel éclairs, Tom is even more attracted to her. There are very few movies about cooking or chefs so this one is a treat. Tear drops in the food reminded me of Like Water for Chocolate. The emotions Amanda feels are somehow magically mixed into the food she is cooking. Either the dishes make people cry, stun them or make them lose their inhibitions. She seems to have a magical gift for culinary creations that have an effect on anyone who consumes them. 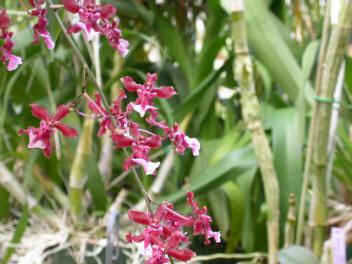 Is the orchid plant in this movie the “Oncidium Sharry Baby?” It did look similar, although I can’t say for sure. Some people say it has a fruity vanilla scent and not really a chocolate scent. Most types of vanilla do not produce the vanilla beans. If you wanted to cook with flowers, you would want to make sure that the flowers you added to your cooking were edible. Orchid flowers are apparently edible. Vanilla beans are the cigar-shaped seed pods from a climbing orchid and the pods must be picked, boiled and heated in the sun. It literally takes months to produce the delicious vanilla flavor. It actually takes 100 beans to make 1 gallon of vanilla extract. If you love vanilla extract, you might also enjoy: Fiori di Sicilia flavoring for your baking. After watching this movie you may want to feed your lover oranges, invest in some expensive vanilla extract, get lost in a kiss or cook up some bliss. If you are looking for the best vanilla for your cooking, Bourbon-Madagascar vanilla is superior. Deliciously cute, silly spells, sweet innocent love and a few hot and steamy kissing scenes in the kitchen. For romantics and lovers of kitchens and cuisine. Almost a culinary Cinderella story. P.S. If you need a recipe for the caramel iced éclairs to entice someone, click here.